Andrew D. Ferrell is privileged to be an attorney at The McCallister Law Firm where he has the opportunity to advocate on behalf of injured people. After receiving his Bachelor’s degree in Business from Cedarville University in Cedarville, Ohio, Andrew graduated from Liberty University School of Law in Lynchburg, Virginia with a juris doctor degree. While attending law school, he was a contributing member of the Liberty University’s trial team and worked as a research assistant. 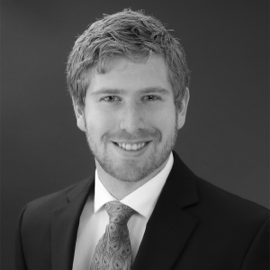 Before joining the team full time, Andrew was a law clerk at The McCallister Law Firm. Though Andrew’s passion lies in the law, as is evident in his incredible work ethic on behalf of his clients, he also enjoys spending time with his wife, Jessica, through their involvement at their church, a competitive game of soccer, watching the various Kansas City professional sports teams, playing guitar, or reading books on theology. Andrew is very approachable and eager to assist in all cases he receives. Some of his greatest attributes are his dedication, his drive and his deep sincerity toward others. We are very lucky to have Andrew with us, fighting for what is right.